In spite of the snow and ice and power loss, we have been enjoying some good meals from our menu planning. Tonight was a Tabbouleh Salad from the Slim Down South cookbook. We had it with fried fish and it was a great pairing. 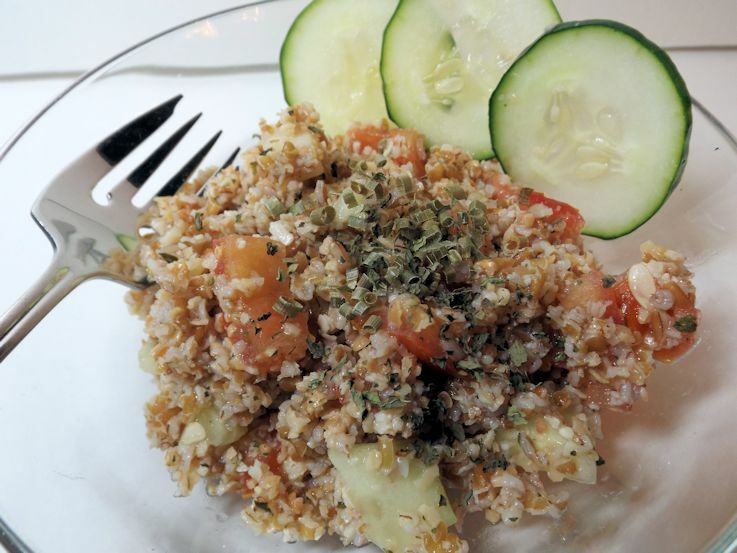 Place bulgur wheat in a large bowl and add boiling water. Cover and let stand 30 minutes (or up to 2 hours). Drain and press the extra water from the wheat. In another bowl mix together remaining ingredients; add to the wheat. Chill one hour. Serve on romaine lettuce leaves.